How comfortable do you feel discussing your faith with those outside the church and answering their questions? This conference is intended to give congregations from across the diocese guidance on how to talk about our faith in contemporary society and respond to searching questions – such as how we know God is real, whether science has ‘disproved’ Christianity and why there is suffering in the world. 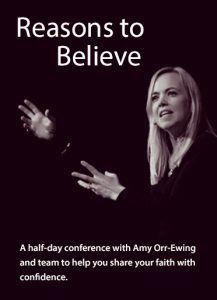 Amy Orr-Ewing, who speaks and lectures on evangelism throughout the world, will speak alongside Simon Edwards and Lara Buchanan from her team at the Oxford Centre for Christian Apologetics. Bishop Andrew will open the conference.